The Saturn in Gemini people love to learn new things and overcome daunting challenges. Being symbolized by the Twins, Gemini can be a bit scatterbrained since they are pulled in different directions. But Saturn in Gemini is more stable and has a better sense of direction than most. With their sharp intellect and strong desire to communicate they can get things done. Saturn in astrology represents a kind of father figure in our lives. This keeps us in line and places restrictions on our more reckless tendencies. 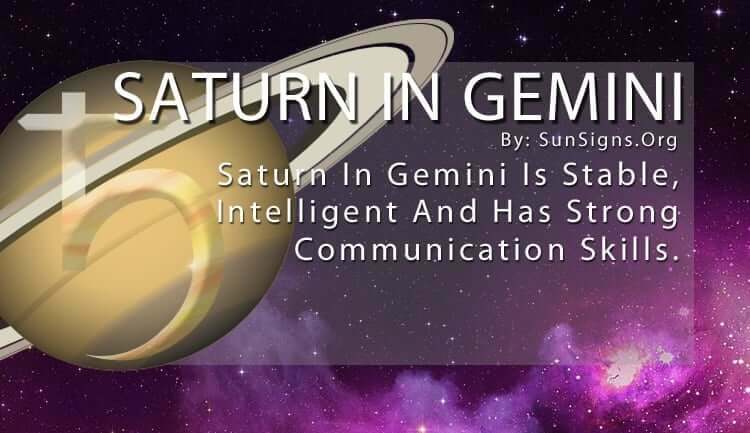 So Saturn in Gemini is more reserved in their thinking, keeping them better focused than other planets in Gemini. They can hone in on a specific subject and become a master of it. This makes them great teachers or anyone involved in the education system. Their thirst for knowledge remains, and they are eager to learn as much as they can in, a short amount of time as possible. Sometimes this manifests as an inability to get their point across effectively because the Gemini Saturn people have so much to say. But if they learn how to organize their thoughts, and Saturn can help with that, they are an intellectual force. Saturn in Gemini can concentrate on the minute details of an issue and soak up the true meaning of what they’re looking at. Saturn in Gemini works best when they are well-organized and working toward one thing at a time. But with their skills, they can overcome this obstacle and lead a perfectly fulfilling lifestyle. They have to remind themselves of their ability to handle tough situations and keep up their self-esteem. Optimism doesn’t come naturally to Saturn in Gemini. So, they have to learn to perfect it. The best way to do that is to constantly challenge themselves. Staying engaged in complex problems helps Saturn in Gemini to build up their self-confidence and reinforce their strong points. Once they start to find that, more opportunities open up to them. When they take risks, they will be able to pick and choose the right battles to fight. The one thing Saturn in Gemini has to be cautious of is their self-doubt. The struggle between changing directions and Saturn’s tendency to keep them on the straight and narrow leaves them feeling unsure of what they are supposed to do next. To overcome this inner debate, they must learn to prioritize their life goals. They need to figure out how to best achieve them. Once they have a plan of action, they can move forward more immediately. Their nature is to go back and forth between subjects. So, Saturn in Gemini is constantly working through the desire to change topics quickly. They want to remain steady without feeling stifled, and that is a difficult balance to maintain. Saturn in Gemini will win more and more of these difficult situations. Then, they will build up the courage they need to continue on this successful path. This will help keep Saturn in Gemini happy and content with where they are going in life. As long as they don’t allow the occasional misstep to knock them off-course, they will keep going forward. This will be difficult for this Saturn sign to reconcile at first. It is easy for them to feel depressed or disappointed by their poor performance. But if they constantly remind themselves of their past successes, they will do well in life.